Cedar Meadow has been a successful thoroughbred breeding and racing stable since 1990. We offer the interested thoroughbred investor the opportunity to experience racing first hand at the highest levels of the sport, in New York at Aqueduct, Belmont, and Saratoga, and in Pennsylvania at Philadelphia Park and Penn National where we've consistently put investors in the winners circle. Cedar Meadow has over a 50% repeat business from our investor base. Affordable... Annual investments can be as low as $5,000 for a 10% share. Responsible... We take pride in what our horses do after they are retired. Check out our page of retired stars. While a few organizations have given the thoroughbred business a bad name, we pride ourselves in finding great homes and careers for our retirees. Eye on the Bottom Line... Cedar Meadow always retains 50% interest in all of its racing prospects, so we are motivated to produce winners. Take some time to browse our site and learn about us and our horses. If our approach to thoroughbred racing and breeding is something that might interest you, then please contact us. 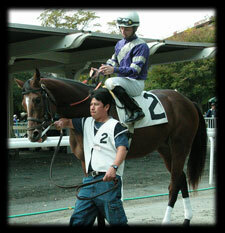 "While horse racing, like all sports, may be about the money, with Cedar Meadow it's done with a touch of tenderness." Quick Wit, son of Thank the Academy scored in the Grade 2 National Museum of Racing Hall of Fame Stakes at Saratoga a $200,000 race. Thank the Academy is a Cedar Meadow syndicated broodmare and she is currently in foal to Breeders Cup and Belmont Stakes winner, Drosselmeyer. 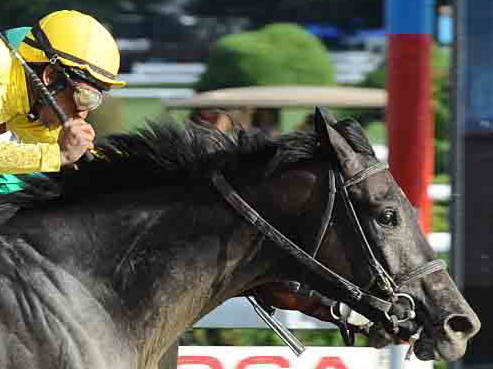 Trainer Dale Romans will be spotting Quick Wit this Fall with an eye on a 2012 Breeders’ Cup race. Primo Via dashed a mile to romp in a mile test and returned $25.80. Guided to victory by John Lloyd this was Primo Via’s initial win and her first attempt at two turns. 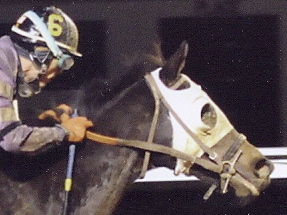 Ayeyarwaddy disputed the pace under mild restraint from Katie Lee and then shook clear on the far turn and won under alert handling by Ms. Lee. It was "Waddy's" first win and Katie's first win since making her comeback as a rider. A star is born as In Volo, in her 4th career start, won Friday night's allowance test at one mile and 70 yards by 11 1/4 ever increasing lengths. The margin of victory and the way she powered to it were impressive and certainly mark her as a rising star. Her final time of 1:43:39 was significantly faster than the time run by fillies who ran a "two other than" allowance race and a "three other than" allowance race on the night's card. The filly who was second in her race has run a "Thorograph 10" and was well meant last night. The horse which was 3rd was 20 lengths behind and she has run 11 1/2 solidly. All of those carried less weight than we did. No matter how you slice, In Volo's effort marks her for future stardom. To put it mildly, her race was a "jaw dropper." In Volo now has two wins and a second and third in four career starts. In Volo overcame tight quarters and having to check twice before finally getting a chance to run late in the stretch, and run she did, taking the $34,000 one mile event by a neck for her first win. Jockey Robert Hastie waited and waited while saving ground all the way around the track and finally had to take the overland route swinging very wide after having to check. But In Volo got in gear again and prevailed. Jason's Prospect staged a furious late rally to put a "W" on the board today overcoming being shut off in the turn and checking and then having to rally to beat 5 horses in the stretch. It took big efforts by two trainers to pull this one off, Michael Sedlacek and Michael Aro. Abel Mariano stayed with Jason and kept working on him through the turn and down the stretch to prevail by 3/4 of a length. For the first time in recorded history Cedar Meadow, Inc. won two consecutive races in two straight races! For the first time in recorded history trainer John Wames won two consecutive races in two straight races!! And for the first time in recorded history Manny Chaves pulled off the "Holy Ghost" [winning three races on the card] by the 4th race. Wisdom's Toll came from off the pace to bury a field in the third race tonight at Penn National. Going off as second favorite she handled the off track like a trooper, surging through the mud and taking command at the top of the stretch. Manny Chaves under strict orders from team Cedar Meadow took a hold and allowed Wisdom's Toll to settle while the top three set strong fractions. Wisdom's Toll moved into contention coming out of the far turn and won as much the best. She was the second choice. Bitta Wisdom splashed home a winner in the fourth race following stable mate's Wisdom's Toll example. Again, Manny Chaves executed team Cedar Meadow's instructions, "Get the lead at all costs." This was not easy. The horse on the outside of Wisdom's Toll was also well meant to go to the front and out broke her. She went into the first turn trailing her and then, for the first time in her career, she passed a horse. Yup, Bitta Wisdom jacked the leader and opened up daylight. The field started closing in but Bitta Wisdom found courage and blasted the field by open lengths putting up a $42.00+ parimutual!